So first we need to understand the naming conventions. Your Primary Partner representative has an Elements user login - which is the email they registered with. They needed that to register for the partner program. They will also have received an Elements Partner Program welcome email with a Partner ID. This looks like FG3877. When you join the Partner program you get unlimited use of an Elements Catalyst Enterprise Space for demonstrating to clients. The first job is to create a Space which will be your demo Space. 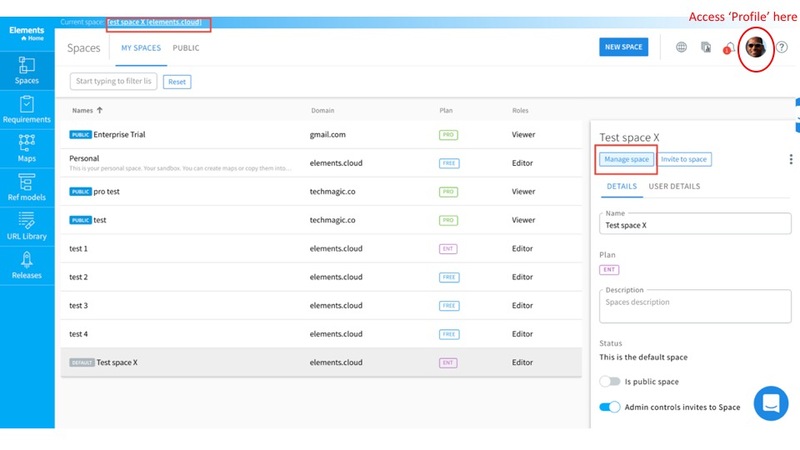 You can create as a trial and the success@elements.cloud can set it to Enterprise. A Space can be connected to multiple Salesforce Orgs (Production & Sandbox). Pro space = 1 Prod + 3 sandboxes, Enterprise 4 Prod + 4 Sandboxes each, Unlimited....well, unlimited. An Elements user can be a member of multiple Spaces. One login - multiple Spaces. You can switch between Spaces. Whoever sets up the Space is the Admin. But you can assign admin rights to multiple people and Admin rights can be transferred by assigning admin rights to another, who then removes yours. So a Space could be set up by a consultant and then transferred to the client at the end of the project. Or you could continue as the Admin and charge the client a monthly fee for managing the Space. Finally, a user needs a separate license for each Space they are an Editor in. As a Viewer they can view, comment and collaborate at no cost. An additional license - Corp IT Amin - provides user provisioning, policies, governance and control at the across all Spaces for a set of domains. Log into Elements using your email address as username. Navigate to the Elements.cloud Spaces page. The Partner ID is used to track and reward referrals. It is associated with a user profile, and also a Space. If a new user is invited to a Space, when they register, the Partner ID is associated with their user’s profile. If that user then creates new Spaces, your Partner ID is now associated with these Spaces. New users are then invited to those Spaces. Your Partner ID is now associated with all of these new user's profiles when then register. If any of the Spaces with your Partner ID are upgraded, whether you were directly involved or not, the referral % will apply to all revenue generated for the time your Partner ID is associated with that Space. If a new partner takes over a Space in the future and changes the Partner ID to theirs, any revenue generated while your Partner ID was associated with it, will still be due to you. This is for the lifetime of that customer. Why? Well you have the relationships and the ability to do a great job that results in a happy customer who values Elements. The more they value it, the more they are likely to upgrade, use and maintain the content for as long as they benefit from the Salesforce platform. Add your Partner ID to the Space you have just created. If you have put your Partner ID into your Profile (accessed from user initials or picture in top right of screen), then the Space you just created will already be associated with your Partner ID. It is important to know how to do this manually - and how to check it, since all referral income is tracked against the Partner ID on a Space. 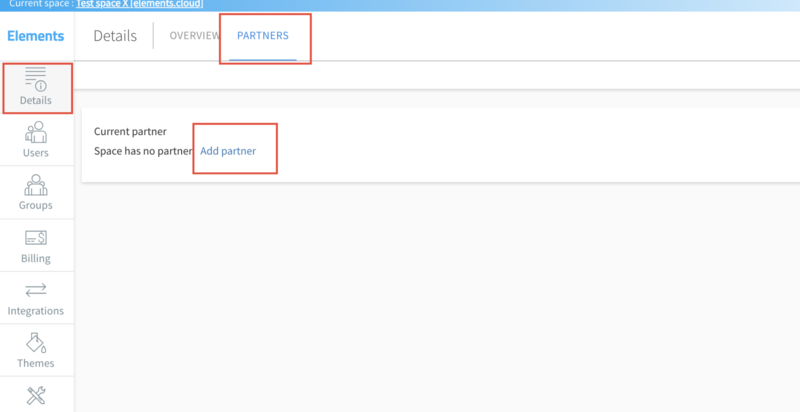 In Space Management you should be on Details and in the top bar select the PARTNERS tab. This will do 3 things. It will associate your Partner ID with their user profile, so it will be automatically associated with any new Spaces they create for their clients. If some of your team already have Element usernames you will need to manually add your Partner ID to their profiles. For each new client you will have a new Pro Space which is dedicated to them. You can connect multiple Production and Sandbox Orgs to this Space. To connect, you install a small free managed package into the Org from the AppExchange. When you run Elements QuickStart it will automatically create a new Elements Space for that client and add a new user (if they do not already exist) to Elements. The username is the email address associated with the Salesforce user who installed the managed package and ran Quick Start. We recommend that you create single Elements user e.g. admin@myfirm.com (remember username is an email address) that is used to run all the QuickStarts for every client. The Salesforce username can be anything, but the email address needs to be admin@myfirm.com That way that Elements user will be the Space Admin for all client Spaces and the Partner ID is o the client Space. That Elements user can then invite the consultants and clients to the client Space that was created. This will massively reduce the administrative load and ensure that the Partner ID gets propagated correctly. You are all set. Let's go and connect an Org.